In a healthy joint, flexible connective tissue called cartilage coats the end of the bones and a thick liquid lubricates it. This allows for smooth, normal movement. In the arthritic joint, the cartilage has worn away and the joint surface has become rough and irregular. This prevents the joint from moving correctly. As the cartilage wears down, bone-on-bone rubbing occurs. This results in further damage, increased pain, and bone spurs. Arthritis can occur in any of the joints of the hand and wrist, but is most often seen in the fingers and at the base of the thumb. It can be caused by many factors, including prior injury, genetics, and some diseases such as rheumatoid arthritis. Many factors contribute to arthritis including prior traumatic injury, genetics, age, and some inflammatory diseases. Osteoarthritis (degenerative) is the most common arthritis and may affect one or more of your joints anywhere in the body. Osteoarthritis impacts virtually everyone as they age and is more common in women than men. It affects 60 percent of adults over age 60 and 80-90 percent of patients over age 75. Rheumatoid arthritis is an inflammatory disease that affects your entire body, especially your joints. Rheumatoid arthritis begins in your hands and wrists as well as your ankles and feet. It often affects the same joints on each side of your body. The cause of rheumatoid arthritis is unknown, though genetics play a role. Arthritis in your hand can result in pain, swelling, and the sensation of clicking and grinding in your joints. Your range of motion, pinch, and grip strength can all be affected. 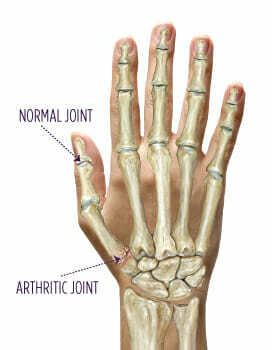 Arthritis was diagnosed by an X-ray and physical examination of your hand. Unfortunately, to date there are no known medications or treatments that can prevent arthritis. Yet many treatments are available to minimize your symptoms. New medications and surgical treatments that provide pain relief will help you get back to the many everyday activities you used to enjoy. Everyone responds to treatment differently. The primary focus is to reduce your pain, improve your motion, and to slow the progression of the disease. With arthritis, treatment can be ongoing and may include adapting your everyday activities in order to decrease your symptoms and improve your function. Your recovery time depends on the severity of your arthritis. A few arthritis-related disorders can be completely cured with proper treatment. Most forms of arthritis however are long-term (chronic) conditions. Talk to your Summit specialist about what you can expect with your specific situation. When surgery is recommended, it usually takes several months to get your strength back to normal.